Big Mon, like Jerusalem Ridge (Tune 1…seems like so long ago), wasn’t completely new to me when I picked it as tune of the day. But it needed some careful study, and so tune 20 it is. A.D. was a big help for this one, recording a tutorial for me, playing it slow and then a second time through at a medium pace. Now that I’ve hit the twenty tune mark, they’re all jostling around in my head and melding one into the other. Especially the A tunes. Twice, while practicing, I went into Big Mon instead of going for a second cycle of Gold Rush and Sally Ann. Admittedly, that has a lot to do with my less than focused practice in the last few days. So tonight I buckled down, declining partying and mayhem for a night of responsible fiddling. If there is such a thing…doubtful. Fiddlers reading this, you know what happened…after an hour or two of metronomes, scales, practicing each tune…Bach came back. There is no escaping! No matter how many Minor Swings or Sally Goodins or Benton’s Dreams I ingest, those sonatas and partitas keep hijacking my late nights. I took Chogyam Trungpa’s life advice and surrendered. I even took the mute off my fiddle. But then, like many late night practice-meditation-trip-salsas, I sat down to account for day 20 of this here experiment, and it all came together with a listening session: Oliver Schroer. If you’ve yet to discover this incredible musician, tarry not! Today also provided a joyful event in that I remembered a great music book: “All Star Bluegrass Jam Along”. 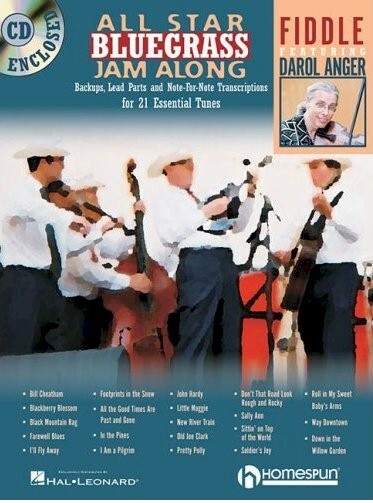 Check it out, it’s sheet music prepared by Darol Anger, with 20 bluegrass standards and solos to go with each, all with a cd which includes both the fiddle and the backing tracks. It’s great to practice improvisation with. I used it for Soldier’s Joy, looking to keep a nice consistent bow and play within the chord structure. Gold Rush is an awesome tune. Watch Bill Monroe and Byron Berline (both of whom wrote it) play it with Mark O’Connor. Perhaps it was starting on Sally Ann that helped (through some strange tune sisterhood magic? ), but Sally Gooding is coming along way better than it ever has. In fact, it’s all coming along. This is the eighteenth day in a row that I have learned a tune and practiced up to nine other new ones. I couldn’t say how my sound has changed, but I do notice a difference. It certainly feels a whole lot better. My fingers feel more comfortable traveling along the neck, and my bow has become slightly more controlled even as it’s movement seems more fluid. But if just feels a whole lot better. It seems, too, that my mind slows down…what seemed fast some days ago now seems relatively slower, in the very experience of time itself. Kind of like when you see something fall in the periphery of your vision and your experience of time in that moment slows so that you can turn and catch what is falling (yourself, as it sometimes happen. Especially if your Feela flipping over your handlebars). As it turns out, bluegrass tunes in A are great for working your fourth finger, especially Sally Goodin, because you drone through them a lot (Uncle Pen, another Monroe tune, has that advantage, too). Your fourth finger is always reaching up on the D string and getting stronger, more precise. And so, in combination with Minor Swing, my flimsy pinky is participating more and more, and staying a little closer to the neck when it’s not in action (instead of swinging wildly out, as it is wont to do). Double stops just happen. B major is fun. The bow…well, that’s still the most challenging part of the whole instrument. But over all, it’s amazing what you can do when you get out of your own way. Despite what seems like momentous progress to me, it would probably not be that noticeable to someone who could compare between January 11th and today. But that’s kind of the exciting part…there’s just so much more to work on. The difference is that it becomes funner and funner to work at something. “Why are all the Sallys so good? !” I don’t know, Jimmy, I don’t know. But Sally Ann is no exception! Today is perhaps the first truly challenging day of the 17 days so far. My first day of (surprisingly extenuating office) work is followed by the desperate need to do groceries, which is hindered by a friend’s tour-opening show (in half an hour) and the need to learn Sally Ann, which is itself hindered by the lack of groceries and my lovely roommate’s chanting group affirming our Life Force in the living room on the other side of my bedroom wall (I’m all for it, of course, it’s just bad timing). But naturally, Sally Ann takes precedence. Bluegrass version? Old Time version? Western Swing version? I don’t know…My brain feels like jello. I’m not even sure I can tune a fiddle anymore. I’m not even sure I’m tuna anymore. It’s gettin’ hairy…and haried. Not this tune in particular, but the situation has changed: I’m now emplyed full-time (as opposed to almost completely unemployed). So no time to write about Monroe’s Hornpipe, just 45 minutes to learn it and practice tunes seven to fifteen (plus some Minor Swing, of course). It’s starting to get a bit crazy. How exciting! I am determined to stick to this plan of a tune day for one hundred days, but I foresee several frenzied days between now and April 21st. But there is certainly time to say that the idea of a tune a day seems to have captured the imagination of a few fellow musicians. So, you know who you are *Hommar*, let us know how it goes for you! Thank you, Meaghan!!!! This crazy girl sent me a video tutorial of herself playing her (current) favourite tune, “Road to Errogie”. Meaghan claims it’s a Cape Breton by Troy McGillivray, while the video linked above has a comment by an audience member saying it’s his tune, and it’s Scottish. The important thing is that it’s in B major, just like Rebecca. So I practiced and played it plenty and loved it, too and will practice it until I next see Meaghan. At which point we’ll rip it. I practiced Hangman’s reel for the last time today. My original plan would have seen me practice it last on the tenth day, so the same day I would have learned tune 13, but I liked it so much and I wanted to play it up to the same speed as the fiddler I learned it from. It took 12 days, and the bouncy bow is still not quite precise, but I am happy say to it’s learned. And as for Minor Swing, tune 5, is going to stay on the roster for way longer than the ten days. At least until I get that slow vibrato on the high D#. I project another six months. This afternoon I wondered again if this was too big a commitment to have made. A tune a day is quite a lot . So far, though, it’s manageable. I am noticing in ever greater detail what it is I want to improve. Today, in particular, after watching a film of myself playing Eighth of January, I realize how much more fluid my bow arm could be. Style is a major component that needs a lot of developing (things like varying the types of grace notes and ornaments depending on the style of tune you’re playing – Cape Breton, Old Time, bluegrass…). And then just plain precision. How to play that Irish triplet! How to slow down your vibrato! I n t o n a t i o n.
Thanks again, Meaghan, you and Road to Errogie rock!